In the early 1900’s William’s sons, William J. and Philip, invented and patented the first street paver and established the Koehring Company of Milwaukee, the largest manufacturer of heavy construction equipment in the world at one time. Liberace and his brother George who played the piano displayed in our dining room when visiting the Koehring home. The piano had been handed down through the family to Mr. John Green who generously donated it to be displayed and enjoyed in the hotel built by his great-great grandfather. In 1914 the hotel was converted into storefronts, apartments and “Mueller’s Central House and Buffet” by Mr. Philip Mueller, another prominent Kiel resident. 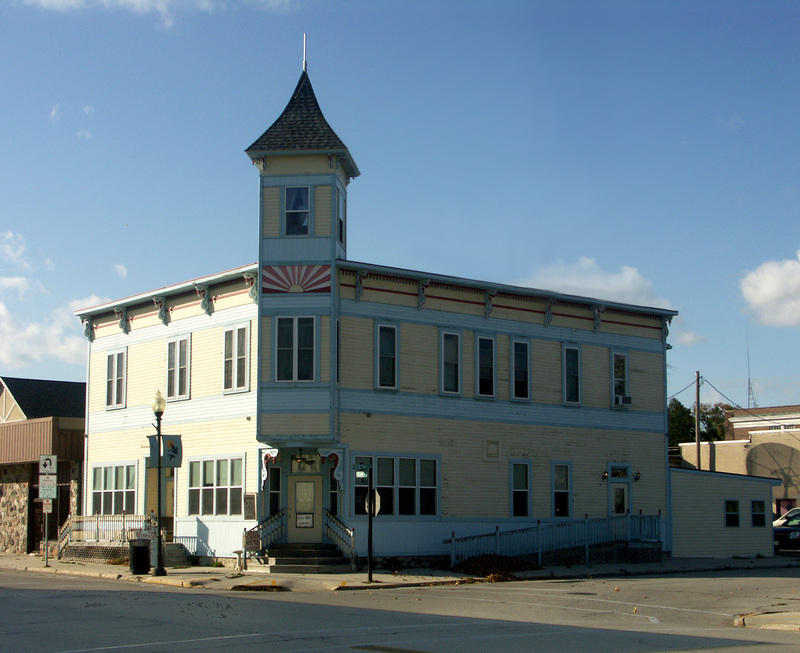 The current owners have restore the hotel and currently operate it as the Koehring Grand Central House Restaurant. Many antiques and memorabilia from the early 1900s are currently displayed throughout the hotel. The MPI Network conducted separate interviews with the two current owners of the Koehring House, a waitress and a bar tender who resides in one of the upstairs apartments. Each of these individuals stated similar personal experiences of paranormal activity. Connie, the current owner provided us a map in which identified target areas of where paranormal activity has occurred. She noted that on the first floor footsteps had been heard, a glass flew off of the bar, an apparition was seen by a bypassing customer, a chair moved by itself, a child claimed to have seen “a monster” under the staircase, both the bathroom and basement lights have flipped on and off by themselves, and some workers have noted their hair being pulled. Workers have also witnessed lights dimming and then lighting up again on the upstairs level, a garbage can began rocking by itself, beads in a doorway began swaying by themselves, an apparition of a cat, a door that opened and closed by itself, wind chimes moving on their own, voices and footsteps, curtains moving without reason, a bulb burst in a lamp that was unplugged, the channels on the tv flip by themself, and loud banging inside the walls has been heard without explanation. 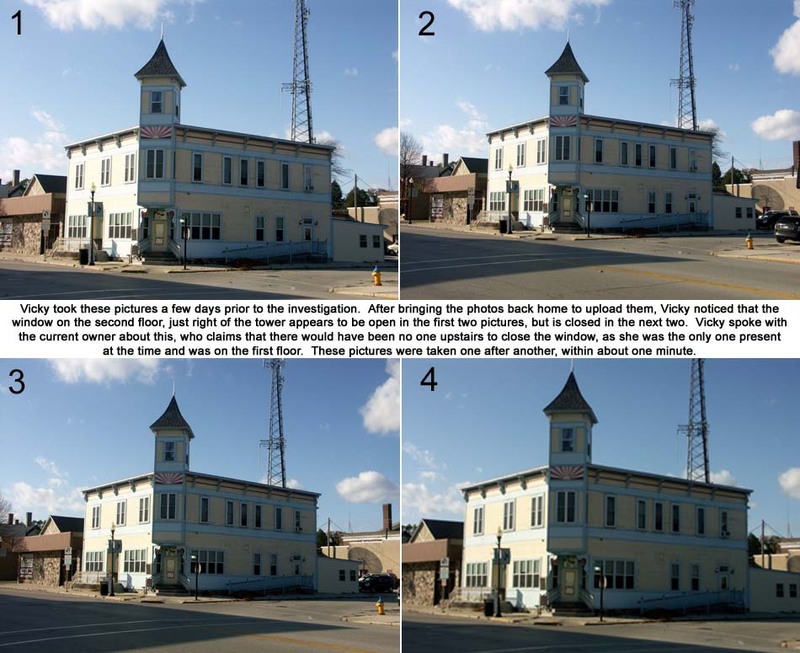 The hotel had not been previously investigated. Our team was interested in the prominent families of Kiel, the Koehrings and Muellers, who both once owned the hotel. After researching their histories, we discovered that Philip Koehring, had been mysteriously murdered on Halloween eve and discovered on a back road in the country, outside of Mauston, Wisconsin on October 31, 1931. We decided to conduct our paranormal investigation of the Koehring Grand Central House on the eve of Halloween 2011, exactly 80 years after Philip’s death. It was a calm and damp, fall night. Note – Headphones are recommended when listening to EVP sound samples. Spirits do not speak at the same frequency we do. “Babe, down here.” Caught at the very beginning of investigation. Vicky is heard stating, “EVP session, Koehring House…” and is interrupted by this whisper. The EVP alone is heard here..
“I want to pet you..” Vicky is heard asking a question about the Tower, which was put back atop the building after 80 years. This whisper is heard, apparently interested in things other than the tower. “I don’t want to.” Vicky is heard inviting the spirits to talk and ask questions of their own. Apparently, not all of them felt comfortable doing this. “I’m not dead” Doug is heard talking about whispering he is hearing behind him. This female voice is caught at that moment. The EVP alone is here. Child scream : Captured at very end of 1st floor investigation. It was approx 1030 at night, and no children were outside. “Knock on wood” Jim is asking if the spirits could show signs of thier presence. This reply is heard, followed by what sounds like 4 knocks. “1898”: Captured using Spirit Box. Scott asks, “What year is it to you?” This whisper offers a direct response. “Cry for Help.”: Captured upstairs, where evidence shows the mood of the investigation began to change to a more somber feeling. The EVP alone can be heard here. “Don’t you leave me.” Also captured upstairs. This EVP has vocality to it, which is unusual for most EVPs. “Don’t you leave..” is quite clear, while the “me” fades out and is almost inaudible. “My name is Philip Mueller!”: Captured upstairs. A rare response to a question asking for a name. Unknown as to whether this is in reference to Mueller or Koehring. “Koehring.” The original owner’s family name. Milwaukee manufacturer, who was found shot to death near Mauston a week ago, left an estate of $1,400,000, according to a petition to probate his will filed in county court today. Under the terms of the will, the entire estate is left in trust for his widow, Mrs. Norma Koehring, and his sons, Calvin, Robert, Martin and Philip, Jr. The estate consists of $1,200,000 in personal property, the majority of which is his interest in the Koehring company, manufacturers of highway building machinery, and real estate valued at $200,000. Milwaukee industrialist, committed suicide, was accidentally shot by his own rifle, or was slain remained a mystery today. A coroner’s jury hearing detailed testimony regardin the death returned an open verdict yesterday, stating Koehring died from gunshot wounds inflicted in a manner unknown. Two weeks ago today his body was discovered in his large coupe near here. The automobile had veered from the highway, crashed through a fence, and halted in a field about 300 feet from the road. Koehring had a rifle bullet in his head. His rifle rested against his leg. Preliminary survey indicated suicide, authorities said, but many circumstances were unexplained. Witnesses were discovered who said they saw two automobiles chasing his car, but no one was found who saw the actual death. Accordingly, it has not been determined whether he was robbed and slain after being forced off the road. Testimony at the inquest was contradictory and unsatisfactory, unwarranting a verdict either of suicide, slaying or accidental death, members of the jury said. The fact that the automobile in leaving the road dropped several inches led to the theory the manufacturer’s rifle, behind him in the automobile, might have fallen sharply and discharged. Tests before the jurymen indicated such a thing could have happened, Dist. Atty. Edward Vinopal, Jr., said. The case, undecided officially, still demands solution, Vinopal said, and he will be glad to investigate any new evidence. Milwaukee (AP) – A new trial in the $50,000 suit brought against the Northwestern Mutual Life Insurance company, by the Philip A. Koehring estate, was denied today by Circuit Judge Otto Breidenbach. In the trial, a jury found that Koehring, Milwaukee industrialist, committed suicide on Oct. 31, 1931. The estate contended he was slain and sought to collect a $50,000 insurance policy. The new trial request was accompanied by a claim of new evidence. A native of Kiel and a former Manitowoc man, both deceased, are among four 1970 nominees to the Wisconsin Industrial Hall of Fame, it was announced today by Paul E. Hassett, executive vice-president of the Wisconsin Manufacturers Association, sponsor of the event. They are the late Philip A. Koehring of the Koehring Co., Milwaukee, who was born in Kiel and died in 1931, and Joseph Koenig, founder of Mirro Aluminum Co. in Manitowoc and Two Rivers, who died in 1929. . . The late Philip A. Koehring, born in Kiel, Jan. 18, 1876, joined with his brother, William J., and Richard, Kiel, in a partnership in Milwaukee to manufacture a concrete mixer of his design. The business was incorporated with $1,200 capital in 1907 under the name Koehring Machine Company, and was changed in 1921 to Koehring Company. Secretary and treasurer of the company until his death, Philip’s engineering skills played the major role in the firm’s early success and development. He individually held some 20 patents on products and methods ranging from the first concrete mixer to a water measuring device and a concrete transporting truck. Today, the company bearing the family name is still known primarily for its wide range of construction equipment. Buy by steady internal growth and through acquisition and diversification, Koehring Company has expanded to become a worldwide leader in the production of machinery for plastics, metalworking, papermaking, material handling and agricultural markets, as well as hydraulic componentry. . .
Lots of interesting disembodied voices, bumps and noises! Will take us a while to review the evidence as we took almost 2 1/2 hours of audio.